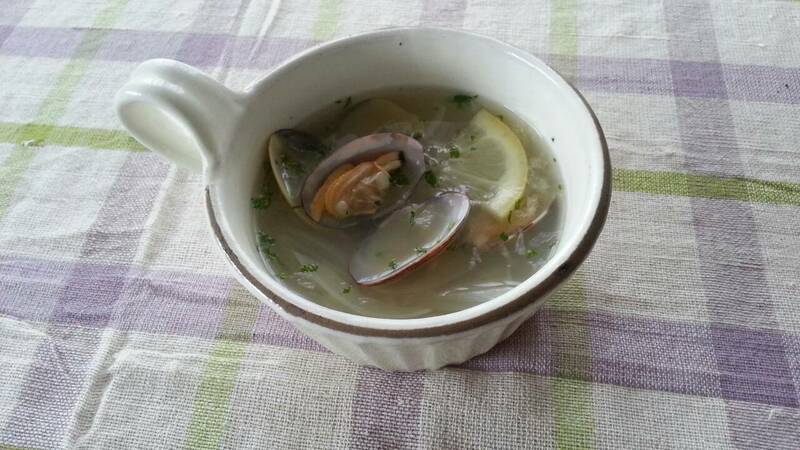 ① Place the clams in a 3% solution of salt water (e.g. 30g of salt to 1 liter of water), cover the container with aluminum foil, and set aside for about 1 hour. This is to get the clams to expel whatever sand they may contain. Rinse the clams in water. Cut the onion into thin slices. Crush the garlic clove. ② Add the clams, water, sake, garlic, and onions to a pot and begin to heat. Skim off any foam that develops. Once the clams open, add the minced shio lemon and soy sauce, and continue heating until the water boils. Turn off the heat and add the black pepper. Transfer the clams to a bowl and garnish with minced parsley.